This space offers two bedrooms and two bathrooms with one King and one Cal King size beds. All linens are provided as well as additional blankets. 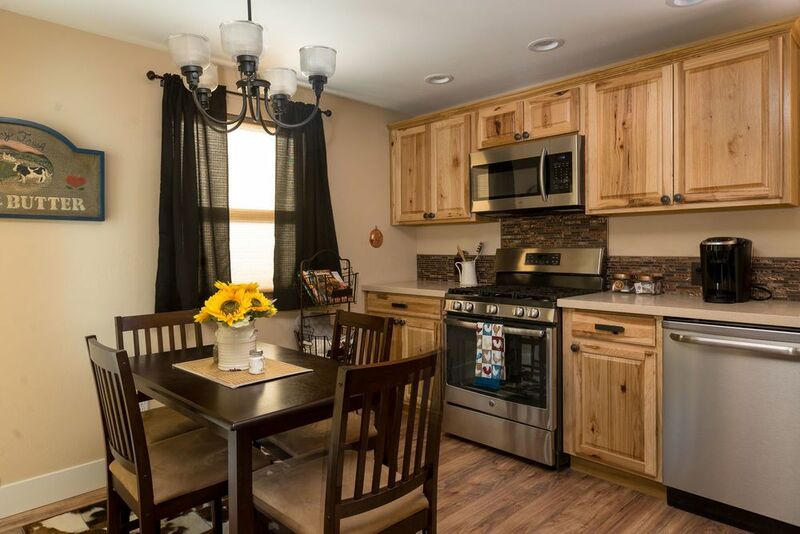 This home has a small kitchen and dining area that is fully equipped with all cookware and dining items. Kitchen has all new stainless steel appliances and even a copper sink! Includes refrigerator, gas range, dishwasher, microwave, drip coffee maker, blender, and hand mixer. There is a laundry area with washer, dryer, iron and ironing board for guest use. Outdoor seating area with gas BBQ. THE WEST SIDE COTTAGES are a group of 7 small cottages designed with the personality of Paso Robles! Each cottage is different. It is a great place to rent for small groups or large groups who would like to stay together but want their individual space. This cottage is a downstairs unit, there is another cottage above it. See our other listings to find the other 6 cottages. This home features 2 bedrooms with a Cal king and king size bed and two full bathrooms. Enjoy preparing dinner in the fully-stocked kitchen complete with a refrigerator, dishwasher, microwave, Keurig coffee maker, and blender. This cottage has everything you need for a perfect getaway! This cottage is located below another unit. We loved staying here for our girls wine weekend. It was very cozy, clean, has a great view on the back patio and is in a fantastic location. Everything was perfectly set up and the check in process was very easy. The backyard patio has a great view and we saw quite a few deer walking by the property. We also thought it had the most comfortable couch we had ever seen. Would definitely want to stay here again. The place looked like it was brand new. It was great for 2 couples. Plenty of space and comfortable. Will be back again. The apartment was nice and had everything we needed. Walls are paper thin. We had a great stay here. The location was convenient to the downtown area. The place had everything you needed. The only bad thing was having guests in the unit above us. We could hear their every move. However that is not the fault of the property. We will definitely come back however, make sure we stay in a unit upstairs. We loved our stay. It was perfect for the 4 of us. It had everything we needed. It's location close to downtown Paso Robles was great and freeway access was quick and easy to get to our favorite wineries!! Would love to stay here again soon! Good location, and good space for 4 adults. Well equipped kitchen.